This band originally started life as Adam Faith's backing band, appearing on several of his records and the On The Move album. They also had a pretty prolific vinyl output themselves. John Rodgers was killed in a car crash in 1964 being replaced by "Mod" Rogan. This line-up (B) remained in place until they split in 1967, although John Beddingfield replaced Henrit for a while in 1964/5. Beddingfield departed for Blues Roots in 1965. Thereafter Ballard and Henrit were briefly with Unit Four Plus Two before forming Argent. Henrit now plays with The Kinks. Commercial success always eluded The Roulettes who were from Hertfordshie. 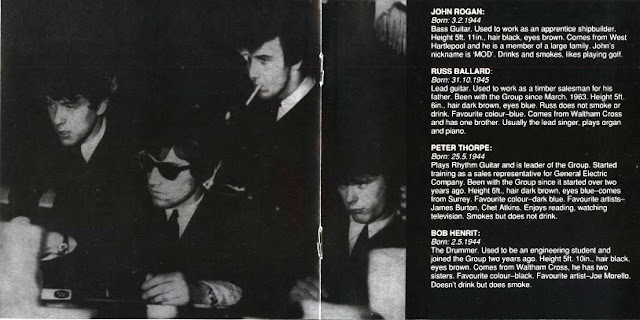 One of their 45s was penned by fellow Hertfordshire group members Brian Parker, Tommy Moeller and Robert Henrit (of Unit Four Plus Two). They also spent a while in Europe during 1967 supporting French rocker Richard Anthony. 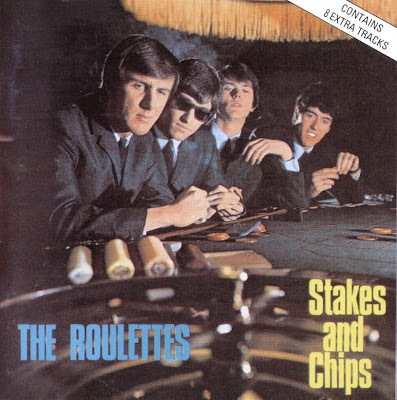 Their Stakes And Chips album didn't sell in any significant quantities at the time but is now a mega-rarity.